The beer pours a clear amber with ruby hues and a white head. This is also highly carbonated with lots of tiny bubbles rising from the bottom of the glass. Well, I must say I’m a little disappointed, this is really just another American IPA. I was expecting more of a winter warmer. Oh well, I still owe you the normal rundown on the taste. Gee, maybe I can’t. This is a one trick pony. It’s all hops with little to no malt flavors at all. The taste does start out with some sweet caramel malts but that only lasts for a split second. Then a hop bitterness starts followed by a high effervescence. The carbonation is not very cleansing because just on top of that is a stronger hop bitterness. By the time you get to the swallow, well, you better like hops. From the top of the swallow to the finish and final aftertaste is all varying amounts and types of hop bitterness’s. It is not overly bitter but it is overly hopped, in my humble opinion. There is probably a nice malt aspect to this beer but you will never find it behind all of these hops. Now if you are a hop head then this is a beer for you. Personally I like beers that have some malt balance to them. A beer like this is just too one dimensional for me. This really is not a bad beer. It’s just not to my liking. There are more ingredients to brewing beer and it’s just a crime to steal all those wonderful beer flavors away and all you have is hops. I think I’m harder on this because I was expecting a winter ale not a summer IPA. At any rate it really isn’t that bad. I’m afraid I made this sound worse then it really is. For a winter ale it falls way short of a good grade. 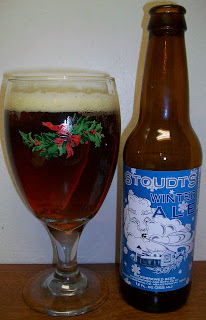 It does not have the heartiness and malty aspects of a winter ale. So for that I’ll have to give it a C-. Now if this was marketed as an American IPA I would give it a B.